I first heard of loosemeat sandwiches from Roseanne, the sitcom. Yes, I did watch that show. It was quite good, quite funny. Then, Roseanne's face suddenly changed, which is when the show jumped the shark, in my opinion. Which is why I remember the loosemeat sandwiches. It might have been the only good thing that came out of the show post-plastic surgery. The loosemeat sandwich was introduced to Roseanne by Jackie, who was, at that time on the show, a truck driver. She told Roseanne that truckers would line up at a little diner to have one of these loosemeat sandwiches. When they finally opened The Lunch Box (that was a pretty good name for the restaurant), I noticed that they had the meat in a steam table pan set-up, with the meat being very loose indeed. 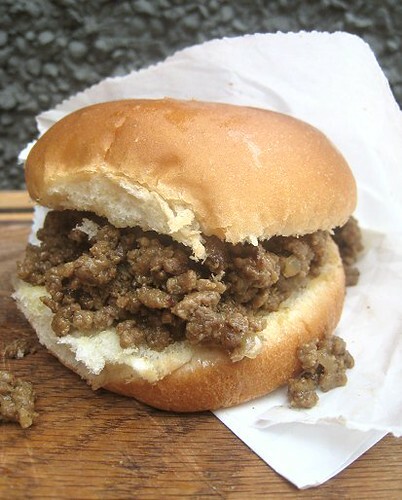 To make a sandwich, they would scoop out some meat, letting the juices drain, before putting the loosemeat on a bun. Of course, this is all according to my memory (sketchy, I admit), plus a TV show's portrayal of the sandwich. However, since I have never heard the loosemeat sandwich mentioned ever again in any other context besides in Roseanne, this loosemeat sandwich memory of mine has become the platonic ideal for me. Then, not too long ago, I saw a loosemeat sandwich post on More Than Burnt Toast. My heart went pitter-patter. Apparently, there is some background story about the loosemeat sandwich. 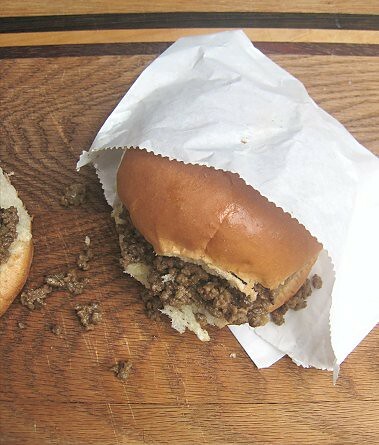 Upon further googling, we came upon this forum with a post on the "original loosemeat sandwich". On the forum, "NebGuy" urges everybody to try making the recipe as is at least once. So, here it is! As per the recipe, I even used lard! Good thing I had pork fat lying around from making White Pork with Garlic Sauce. When the fat was hot, I sprinkled a layer of kosher salt onto the bottom of the pan. 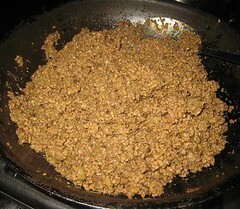 Then, I started browning ground beef, making sure to squish the meat so they crumble into little pieces. I also added onions at this time. After cooking the mixture for a bit, I added yellow mustard, vinegar and sugar. Some water went into the pan as well, barely covering the meat. I let the mixture cook over low heat until the liquid evaporated. We even bought some hamburger buns for just this occasion! Wow, I didn't realize hamburger buns were so small! They're cute. We microwaved ours for that "steamed" effect, then plopped some loosemeat on them. In my fantasies, which of course are also influenced by Roseanne's representation of the loosemeat sandwich, I had imagined the loosemeat sandwiches to be a tad more "juicy." I had thought that the meat mixture would be stewed in some kind of broth and these juices would run down my arm when I bit into my sandwich. In this version, the meat was "thicker." I had the same thoughts. The meat held together too well. I wanted them to tumble all over the place in their looseness. Could it be because I didn't drain the fat/liquid after cooking the ground beef-onion mixture? In my defense, there really wasn't much liquid in the pan when the beef was browned. I found the meat filling to be too sweet for my taste. We would probably omit the sugar altogether were we to make this again. My priority is to make the meat loose! I will try to have the loosemeat swimming inside some liquid, just like in Roseanne. Yes, I think we will make this again with our modifications. It was quite satisfying to eat, especially when you bite into the squished bun. Because you do have to squish the bun to eat. I forgot to squish the bun and take a picture! On the same day, we made Sloppy Joes. To read all about the loosemeat sandwich story, visit this forum. I have reprinted the recipe below for ease of reference. 1) Get out a cast iron skillet-they are the best for loosemeats-or other kind if you have no iron skillet. 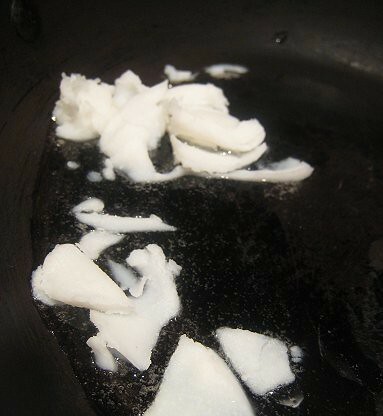 2) Melt fat over medium heat and lightly salt bottom of skillet. 3) Break ground beef up in skillet and start crumbling it with the back of a wooden spoon-this is very important-the meat must end up being cooked up into small crumbles. 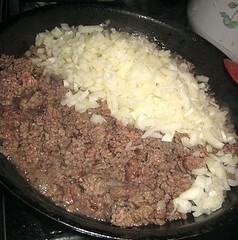 4) Add chopped onion while browning meat. 5) Keep working with the back of spoon to break up meat. 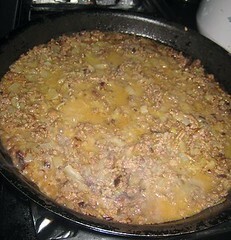 6) When meat is browned, drain off any fat and return meat to skillet. 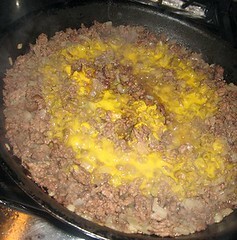 7) Add mustard, vinegar, sugar, and just enough water to barely cover meat in the pan. 8) Cook, at a simmer, till water is all cooked out-between 15-20 minutes. 9) Adjust salt and pepper to taste. 10) Heat your hamburger buns-they're traditionally steamed for loosemeats-I like mine toasted lightly-do it the way you like it. 11) When buns are warm, put yellow mustard on them and add some dill pickle slices-I put on lots! 12) If you start changing this recipe and using things like olive oil for the fat and dijon or honey mustard for the yellow mustard, you will not get the traditional yummy taste of a loosemeat sandwich. 13) Likewise, don't add any liquid smoke or worcestershire sauce. 14) Make them just like this the first time so you can sample the simplicity of this famous Midwestern treat. 15) If you want to start making changes after that by all means do so but I'd like you to taste the original recipe at least once. Oh Roseanne. A show that ill live on in sitcom infamy. I remember watching it when I was little...my parents were none too thrilled. It seems almost like a sloppy joe...minus the tomato sauce. Very interesting. yeah, i had the same feeling about loosemeat being juicy. strange--and i must say this is the third reference to platonic ideals in a week. HAHA Roseanne was the shiz back in the day, my mom wouldn't let me watch it sometimes because she said Roseanne seemed "loud and rude" hahaha silly mommy. 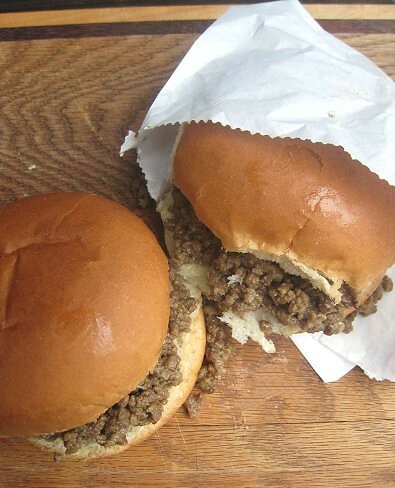 These sandwiches look yummy, like Joanne said, they are like sloppy joes without the sauce! 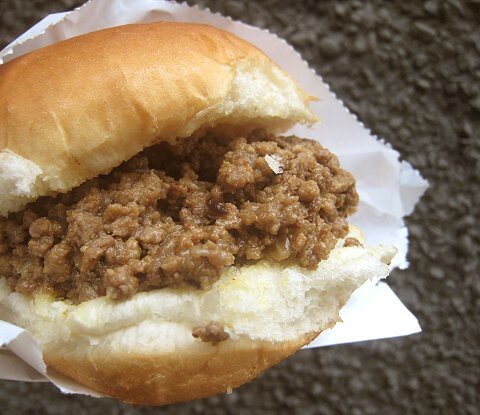 This does look like a sloppy joe; I could see myself eating meat on the days when I crave meat! I just made a lebanese-style gyro today, 'cause I was in a meat-craving mood! Next time I am making this one, it is a heck of a lot easier! PS: I did not like Roseanne one bit: I thought she was vulgar. Not very funny either. I'm here licking my lips and salivating! Just as an aside, if you would like to make the meat "looser" you can cook the ground beef in the same manner that Cincinnati chili is made. Add raw ground beef to about a cup or two of water and stir. You can then add this to the sauteed onions or you can add the raw onions to the ground beef/water mixture. Either way, you'll end up with a very loose product even after the water has been cooked off. It looks pretty gross (a bit like meat gruel) but it makes a very finely cooked loose meat. We've been to one of the Original Maid Rites where the loose meat sandwich came from & is still served, crazy old place. That show was pretty funny. Hehe. It was more "sticky" than loose. Perhaps because of the fat. Hehe, dealing w ground meat does sound a whole lot easier. Oooh, I wonder how that Singaporean filling was made. Very intriguing. Yes, that does sound like it';ll loosen the beef right up. Thanks for the tip! one of my recipes for loose meat states to boil the meat in water to cook it, then drain and smash to get the fine texture, then when you add the other ingredients, cover with beer and let the meat cook in the beer (so the "sauce" is beer-based) - it lends the meat an interesting flavor and the alcohol cooks off. Growing up in a small Iowa town in the 60's and 70's, this was what the moms made for the concession stand at football and baseketball games...because it kept well in a crockpot and at the end of the night, if you had left overs, the meat could be used in tater-tot hotdish! Yes, it seems that boiling the meat first is key! Thanks for the tip.